and feet head. Neither cares. 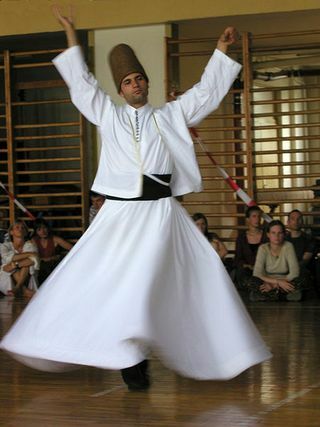 As everybody knows, the Mevlevi are an order of dervishes founded in Konya in the 12th Century by the followers of the great mystical poet Rumi and who are best known for their practice of whirling as a form of “dhikr” (remembrance of God). If you have managed to get this far (not many will have), do the following exercises. 1. Translate this text into Turkish with the aid of the tables below taken from Turkish Grammar by Geoffrey Lewis, which gives you 37 ways of combining tense and mood to make statements about seeing dervishes. 2. Learn all the 37 forms and recite them – a mystical experience in itself. 3. Replace dervishes with another word, I suggest tercümanları (interpreters) or kangaruları (kangaroos) and see what stories you can make up using Turkish verb forms. I was going to see Dervishes. I needed to see Dervishes. Would that I had seen Dervishes! I am said to be seeing Dervishes. I am said to see Dervishes. I am said to have seen Dervishes. They say I ought to see Dervishes. They say, “If only I would see Dervishes”! They say, “Would that I had seen Dervishes”!